With spring comes the opportunity to plant a garden. As I grew up I never knew that many people do not grow things from their backyards. My parents were born in the late pioneer times when, if you did not have a good garden during the summer, you would not have enough food in the winter to survive. I learned at a very early age that we plant, and then harvest, and then bottle. If you do this you too can have great garden vegetables all winter. Most of my career was on the road, and there was not an opportunity for me to raise vegetables. But the past few years I have always had tomatoes. My garden was what I would find at the farmers’ market, which has always been a treat. I met two women at the market that raise and sell heirloom tomatoes. Often they have told me how fun it is and that I should plant and raise my own. This year Patricia Messer and Heidi Williams, owners of Late Bloomin’ Heirlooms in West Jordan, Utah, made me an offer I could not pass up. They said that if I would get the supplies they would come to my house and show me how to plant the heirloom tomatoes from seeds. On March 9, 2015, I took them up on their generous offer. We planted about 140 seeds. This has turned into one of the most enjoyable adventures I have had in a long time. I sent them this photo to see if my little plants were ready to be planted in bigger pots. 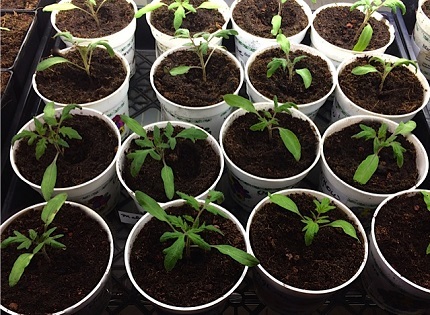 On Saturday March 28, 2015, we once again gathered in my garage to transplant all the little babies. By the end of the planting I had 130 baby tomato plants. They are now under lights for 16 hours a day and in the dark for 8 hours. The best thing is that they do not cry and night and get me up, but I learned tonight after the first watering that it takes a bit of time to water everyone. I would say that in the past three days they have at least doubled in size. Patricia and Heidi told me that in three to four weeks they would be ready to be planted in someone’s garden. My ear perked up when they told me how much heirloom tomatoes cost at the nursery. They said that each plant would sell for at least $4.00. It did not take long for me to figure I had more than $500.00 of tomatoes in my basement. I did not plant them to sell but started looking for friends who planted tomatoes. Now have a file folder with names of my friends and how many tomato plants they want. I have loved the project, which has connected me to nature as I watch my little miracles grow. I can hardly wait for my friends to have a huge harvest of 12 varieties of heirloom tomatoes. If you have the time and the interest, think of what you would like to plant this year. I have also planted other seeds in the yard and have loved getting out every morning to check and see that everyone has water. 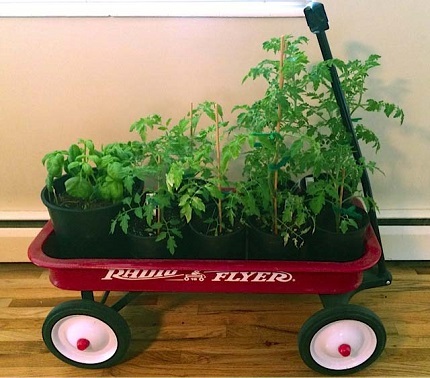 I even have a little red wagon with some tomatoes that I bought at the nursery the first of March. I pull them out into the sun every day and back into my house at night. I will soon plant them in walls of water to keep them warm at night. Have fun and start your own exciting adventure by getting out and planting some seeds. You to will find great joy in getting out and watching the miracle of nature and then as the harvest comes on you will enjoy delicious and nutritious food. Dian is the author of several great idea books including the New York Times bestseller Roughing it Easy. To learn more about her books, go to www.dianthomas.com.